Relatives and masked Palestinian militants carry the body of Hamdan Abu Amsha, 23, during his funeral in Beit Hanoun, Gaza Strip, March 31, 2018. U.N. Secretary-General Antonio Guterres has called for an "independent and transparent investigation" into the deadly clashes along the Israel-Gaza border Friday that killed at least 15 Palestinians and and injured about 1,400 others, including more than 750 injured by live fire. Thousands of people are attending the funerals of some of those killed, as Palestinians observe a national day of mourning Saturday. The U.N. Security Council held an emergency meeting Friday to discuss the unraveling situation in Gaza, but did not decide on any action or joint statement. Danny Danon, Israel's ambassador to the U.N., who did not attend session because of the Jewish Passover holiday, said in a written statement the emergency meeting was held "Despite fierce opposition by Israel and the United States, and requests to postpone the meeting until after the Passover holiday…." Danon said "While Jews around the world gathered with their family at the Seder table to celebrate the Passover holiday, the Palestinians sunk to a new deceitful low so that they could use the U.N. to spread lies about Israel." The Israeli military said its troops used "riot dispersal means" to quell one of the largest Palestinian demonstrations and outbursts of violence along the border in recent years. Palestinians attend Friday prayer during a tent city protest along the Israel border with Gaza, demanding the right to return to their homeland, in the southern Gaza Strip, March 30, 2018. ​Palestinian envoy Riyad Mansour strongly condemned the "massacre" of "unarmed defenseless people" and called for "international protection" for those living under Israeli occupation. He also lashed out at the U.S., saying if it wants to act constructively on the Israeli-Palestinian issue, it should allow the U.N. Security Council to shoulder its responsibility, and uphold international law and Security Council resolutions. 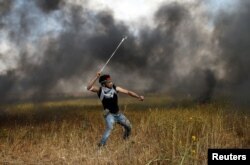 Violence erupted as thousands of Palestinians approached the border separating Israel from the Gaza Strip. The Israeli military said its troops responded to “main instigators” who were throwing stones and rolling burning tires. The Israeli military also accused militants of trying to carry out attacks under the cover of mass protests. The Palestinian Health Ministry said Israeli forces fired live bullets, rubber-coated steel pellets and tear gas. It was the deadliest day in Gaza, a self-governing Palestinian territory, since the 2014 war between Israel and Hamas. A Palestinian hurls stones at Israeli troops during a tent city protest along the Israel border with Gaza, March 30, 2018. U.N. deputy political affairs chief Taye-Brook Zerihoun said at the emergency Security Council meeting that the situation in Gaza “might deteriorate in the coming days” and called for civilians not to be targeted. He urged “those involved to take steps to lower tensions.” Miller also said it was unfortunate that Israel, a close U.S. ally, could not take part in Friday’s meeting because of the Passover holiday. Palestinians have constructed protest tent camps along the entire length of the Gaza Strip in five locations that are expected to remain in place for six weeks. Entire families — men, women and children — were expected to participate in the tent camp demonstrations. The Israeli military estimated about 30,000 demonstrators were taking part in the protests. The weekslong demonstrations, to end May 15, are designed to commemorate the Nakba or “catastrophe” when hundreds of thousands of Palestinians had to flee their land or were expelled during the war in 1948 that led to the creation of Israel. Israeli soldiers are seen next to the border fence on the Israeli side of the border with the northern Gaza Strip, Israel. Israel has deployed more than 100 snipers along the Gaza Strip. The demonstration is expected to end at the same time Washington plans to open an embassy in Jerusalem, a move that has infuriated Palestinians who have claimed the eastern section of the city as the capital of their future state.